Only two days after arriving, three of the RAF Harrier GR.3's started their ground attacks by hitting a fuel dump at Fox Bay East with CBU's. Then next morning, Friday the 21st, and after G Sqdn SAS reported Argentine helicopters dispersing at night from Stanley, a number were caught on the ground near Mount Kent and a Chinook and Puma destroyed by 30mm cannon fire [a31, a32]. Later that morning, two more aircraft left "Hermes" but one had to return with undercarriage problems. The lone Harrier carried on and during a photo-reconaissance run over Port Howard was hit by ground-fire and crashed [b13]. The pilot, Flt Lt Glover ejected and was taken prisoner of war. 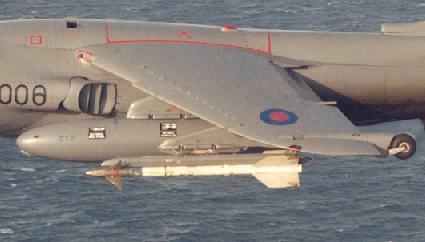 The first reaction to the landings was by Falklands-based aircraft. Grupo 3 Pucaras took off from Goose Green as "Ardent" shelled the airstrip, and one was shot down over Sussex Mountains by a Stinger SAM fired by D Sqdn SAS pulling back from the Darwin raid [a33]. Then a single Aermacchi MB-339A of CANA 1 Esc from Stanley made a cannon and rocket attack on "Argonaut" at 10 am causing minor damage and some casualties. Thereafter, mainland-based sorties that day led to heavy losses on both sides with five of the ships on the defending gunline lost or hit by bombs or cannon fire, and only "Plymouth" and "Yarmouth" escaping damage. One more Pucara and nine Daggers and Skyhawks were lost to the Sea Harriers on CAP and one to a SAM fired by warships. The fierce AA fire from ship and shore made the Argentine aircraft come in low and fast, and although many of their bombs were on target, they failed to explode. Fortunately, they also failed to hit the transports. The main raids took place around 10.30 am, 1.00 pm and 3.00 pm. First to arrive were a total of eight Daggers of Grupo 6. Attacking the northern end of the gunline, "Broadsword" was hit by cannon fire and "Antrim" also badly damaged by a UXB with casualties on both ships, but no one killed. One of the Daggers [a34] was brought down probably by a Sea Wolf from "Broadsword". "Antrim" then moved towards San Carlos Water where the bomb was removed, before heading that night for the CVBG. Shortly after midday, the Sea Harriers on CAP had their first success of the day. Two Grupo 3 Pucaras from Goose Green attacked a nearby naval gunfire observer directing "Ardent's" fire from out in Grantham Sound, three No.801 aircraft closed in, and shot one of them down with cannon fire [a35]. The next mainland attacks were due an hour later at 1.00 pm by eight Skyhawks. Only two of the four Grupo 5 aircraft reached West Falkland because of fuelling problems, and one of these wasted its bombs on the abandoned "Rio Carcarana" in Port King. The fourth however carried on north up Falkland Sound and near-missed "Ardent" with two bombs. At "Brilliant's" command, two No.800 Sea Harriers chased the returning aircraft without success, but instead spotted the next four incoming Skyhawks from Grupo 4 over Chartres in West Falkland. They tried to escape, but two went down to Sidewinders (see photo below) near Christmas Harbour [a36, a37]. Then the afternoon sorties followed, starting at 2.30 pm with six Skyhawks of Grupo 5 which nearly put paid to "Argonaut" (some sources put this raid in the morning). Deluged by near misses, two bombs hit without exploding but two men were killed in the Sea Cat magazine. Steaming at high speed and with engine and steering controls damaged, she was anchored by the action of Sub Lt Morgan, but had to stay in the area for a week until the UXB's were removed and the damage temporarily repaired. Next, twelve Daggers of Grupo 6 were due to arrive. Out of the first group of six from Rio Grande, two aborted and as the remaining four came in over West Falkland, "Brilliant" vectored two No.800 NAS Sea Harriers and one of the Daggers [a38] was shot down near Teal River Inlet by yet another Sidewinder missile. The three surviving aircraft pressed on and caught "Ardent" still in Grantham Sound. Coming in from astern they blanketed her with hits and near-misses destroying her Lynx [b14] and Sea Cat installation and killing a number of men. With only small arms fire left for defence, she headed for the protection of the other escorts off San Carlos Water. As these three Daggers got away, six more from San Julian arrived in two flights of three. The first hit "Brilliant" with cannon fire causing slight damage and some casualties before they safely headed back, but the second flight was wiped out before even reaching the target area. Picked up over West Falkland by "Brilliant" again, two No.801 Sea Harriers shot them down with Sidewinders to the north of Port Howard [a39, a40, a41]. The last attacks started some 30 minutes later by two flights of A-4Q Skyhawks of 3 Esc in the only Navy sorties to reach the Falklands that day. The first three aircraft caught poor "ARDENT" off North West Island and again from the stern, bracketed her with hits and near misses. Badly damaged, on fire aft and flooding, with 22 men killed and some 30 injured, Cmdr West ordered abandon ship and "Yarmouth" came alongside to pick up the survivors. "Ardent" finally sank the following evening. One of the CANA Skyhawks was damaged by the return small arms fire, and all three were caught by two No.800 Sea Harriers near Swan Island. One was shot down by Sidewinder [a42], cannon fire destroyed a second [a43] and hit the already damaged third. Unable to land at Stanley with undercarriage problems, the pilot of this one ejected [a44]. The second CANA flight ran in fifteen minutes later, but failed to hit any of the ships. The Sea Harriers continued to fly CAP, but there were no more raids that day and the transports continued unloading.